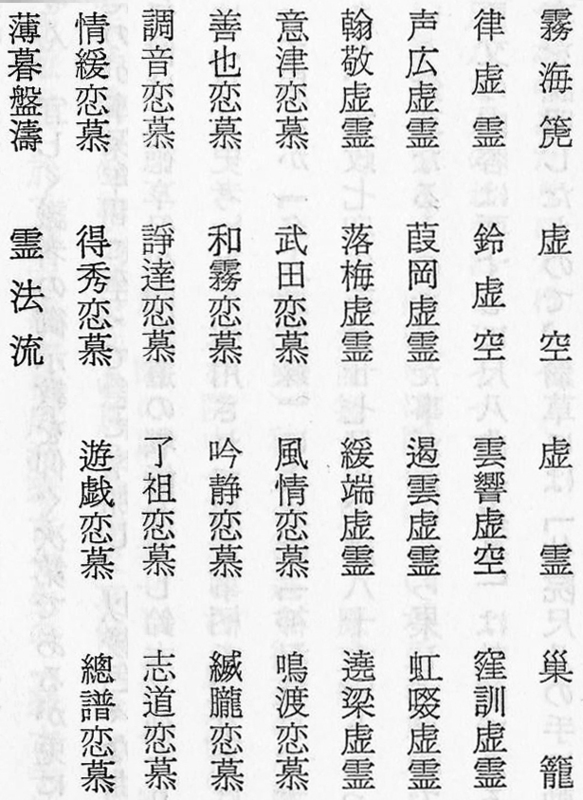 This uniquely important document contains a list of 34 shakuhachi music piece titles, the earliest known of its kind. 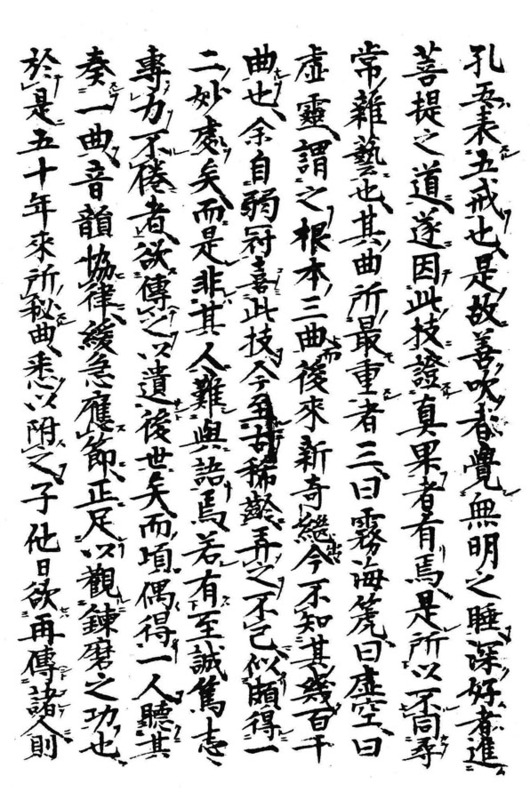 "Record of the Origin of the Shakuhachi". 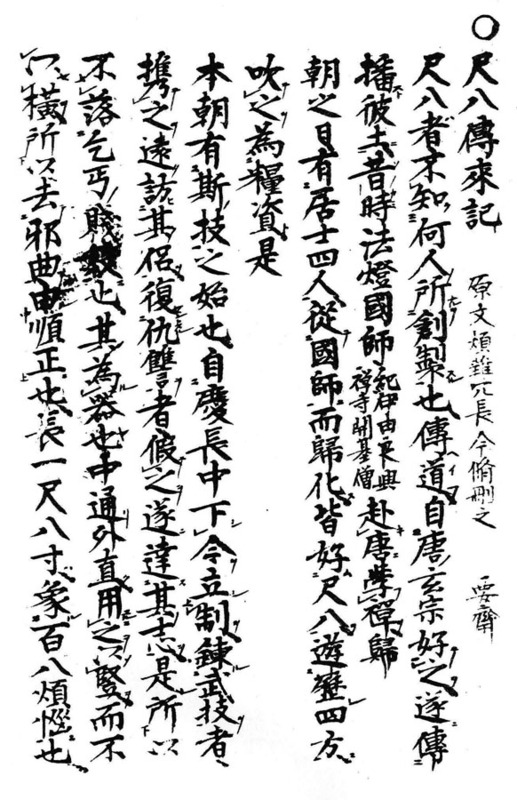 Dated Kyōhō 17 - 1732 in the document itself. Fusō Sanjin Kakushin, 扶桑散人覚心, The Japanese "Useless" Kakushin. That piece of information ought of course be taken with more than just a grain of salt. According to the comprehensive shakuhachi website shakuhachi-genkai.com, edited and webmastered by Katurayama Genkai, the Shakuhachi denrai-ki was related with and possibly produced by the "twin temples" Reihō-ji and Ichigetsu-ji in Edo. The complete text of the Shakuhachi denraiki is reproduced in Komusō zakki, 虚無僧雑記, an anthology of Edo Period shakuhachi-related texts and pictures that was originally compiled/authored by Okumura Noriyoshi, 奥村得義, who lived from 1793 to 1862. Komusō zakki, Komusō zakki, 虚無僧雑記, an anthology of Edo Period shakuhachi-related texts and pictures that was originally compiled/authored by Okumura Noriyoshi, 奥村得義, who lived from 1793 to 1862. 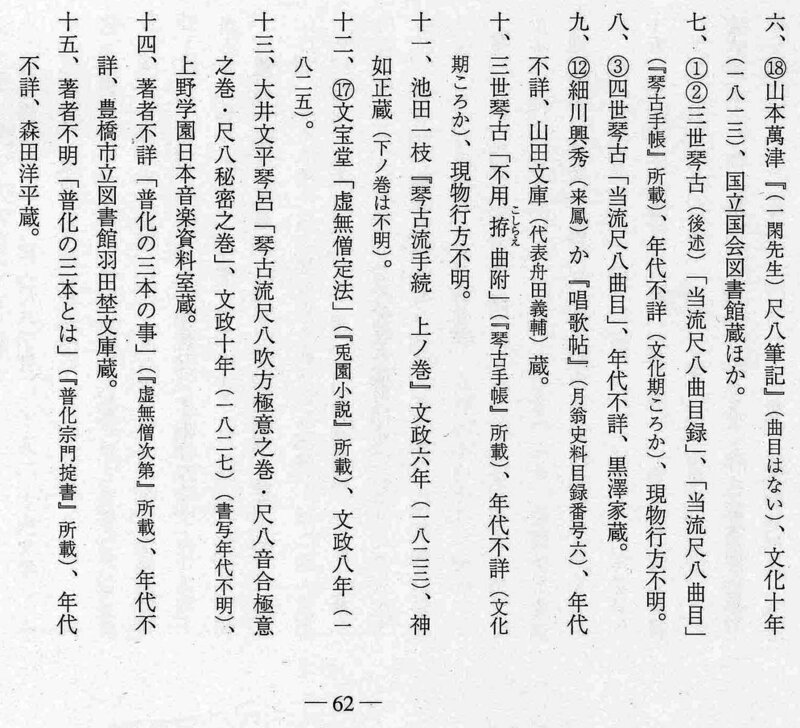 The shakuhachi music piece title list is reprinted in Nakatsuka 1979, pp. 548-549. Source: Nakatsuka 1979, pp. 548-549. 'Mukaiji', 'Kokū' & 'Kyorei' are, of course well known 'honkyoku' titles - where as 'Sugo[mori]' could be 'Tsuru no sugomori', although we shall never know for sure. All the remaining titles are really obscure - difficult to translate and make much sense of today. We have no idea of ascertaining whether the music represented with these titles ever exsited? Do note that 'kana' characters appearing in brackets are reading suggestions offered by Katurayama Genkai on the above mentioned shakuhachi-genkai.com webpage. Kantan Kyorei - "Moderate Origin" Kyorei? Jōryō Kyorei - "Surrounding the Bridge Beam" Kyorei? i.e. "In the Manner of the Spirit Dharma"? 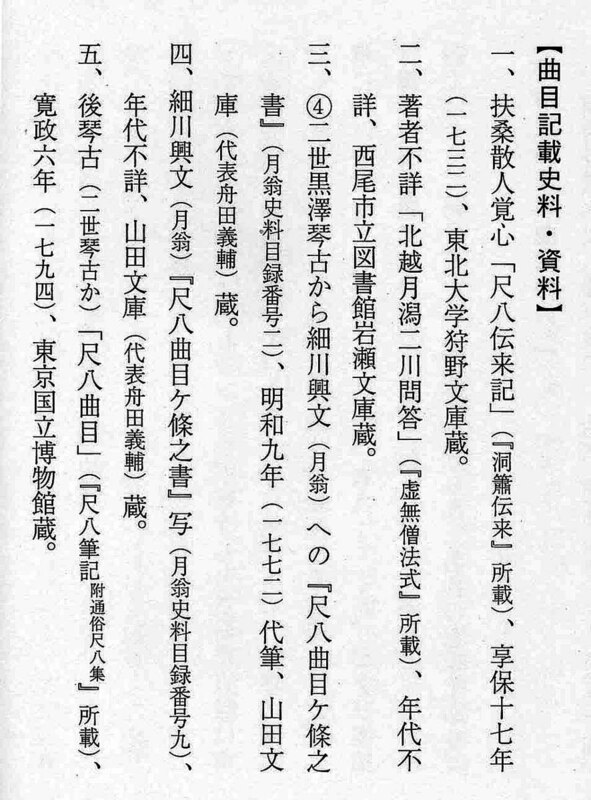 researched by the honourable late Prof. Tsukitani Tsuneko, 月渓恒子 (d. 2010). solo music title sources (2000, page 62]. number 1 at the top right.